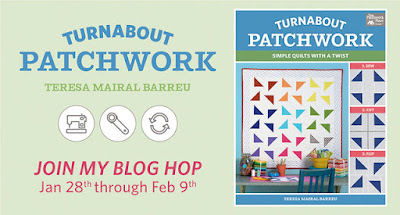 I mentioned previously that I was participating in a blog hop. I realized that I forgot to share the blog hop schedule with you. Teresa @ Sewn Up, Teresa Down Under has a great new book called Turnabout Patchwork. You can buy the book here. I'll be sharing my project this Friday. Here is the schedule. Make sure you stop back here on Friday -- there's a giveaway to win an electronic copy of Turnabout Patchwork. This is a great blog hop so far.